In 2017, Vassar College emerged at #2 on U.S. News & World Report's list of Most Expensive Schools. So what's it doing here? Well, Vassar is committed to meeting all of students' demonstrated financial need. Moreover, enrollees from low-income families get priority - a lot of their loans are swapped out for grants and scholarships, and all financial aid determinations are based on need. Vassar also participates in the QuestBridge National College Match Program, which assists low-income students with securing full four-year scholarships. Veterans benefit, too; Vassar is a Yellow Ribbon Program participant, meaning it covers funding above Department of Veterans Affairs limits. No surprise that U.S. News rated it the Best College for Veterans in 2017. CUNY Bernard M Baruch College in Manhattan has a long list of notable alumni that includes 12 Nobel laureates, fashion designer Ralph Lauren and actress Jennifer Lopez. Baruch College provides institutional grants or scholarships to 15% of full-time beginning undergraduates and federal grants to 46% of these students. Upon admission, all students are automatically considered for full or partial merit-based scholarships, including Baruch's Freshman Merit Scholarship, which covers full-tuition for selected students that have at least a 90 academic average and 1300 SAT score. New York residents are also eligible for the state's Tuition Assistance Program, which provides annual awards ranging from $500 to $5,000 depending on financial need. A lakeside campus with nearly 700 acres, SUNY Oswego is a comprehensive university offering its academic community of around 8,000 students the chance to pursue one of 110 majors, minors, graduate and cooperative programs. SUNY Oswego has the following merit-based scholarships for incoming freshmen from New York state: Presidential Scholarships ($4,700 annually), Dean Scholarships ($1,500 annually), and the Merit Scholarships ($750 annually). International students and non-New York state residents may qualify for the Destination Oswego Scholarship ($5,000 to $8,000 annually). High-achieving students with significant financial need and who are entering STEM fields may be considered for the Possibility Scholarship. When combined with other need-based aid, Possibility Scholars can receive a "full ride" scholarship that can be worth more than $20,000 annually. Buffalo State SUNY was founded in 1871 as a teacher's college but today offers 171 undergraduate degree programs and 61 graduate programs. Most students at Buffalo State Suny can expect grant or scholarship aid, with 65% of undergraduates receiving grants or scholarships from governmental, institutional and private sources and 46% receiving Pell Grants. Of all full-time beginning undergraduates, 68% receive institutional aid or scholarships, and the school offers over 15 institutional scholarships to first-year freshman, primarily based on academic merit. Transfer students have fewer options but are automatically considered for a Transfer Student Merit Scholarship, which is nonrenewable and offers a maximum award of $1,000 their first year. SUNY Oneonta is a 250-acre campus ideally located in the hills of Central New York, where undergraduates and graduate students can pursue their chosen field of study from a pool of 70 undergraduate majors, 71 minors, and 14 graduate and post-baccalaureate programs. High-achieving freshmen are automatically considered for the following merit-based scholarships: Presidential Scholarship ($6,170 annually), Dean's Scholarship ($3,000 annually) and the Organization of Auxiliary Services Merit Scholarship ($2,000 annually). Freshmen who will contribute to the diversity of the student body and who have excellent academic history are eligible for the Presidential Diversity Scholarship and the Organization of Auxiliary Services Diversity Student Leadership Scholarship. Each award is valued at $6,170 annually. With too many notable women alumnae to name, Barnard College in New York City is one of the most prestigious private women's liberal art colleges in the U.S. Barnard believes that a student's family is first and foremost responsible for financing her education. That said, the college does provide institutional grants or scholarships to 39% of full-time beginning undergraduates. Barnard does not, however, provide any merit-based scholarships; all scholarships are need-based. Barnard College determines need through a Barnard Need Analysis formula, which differs from the Federal Methodology formula and considers income and assets from all assets, even home equity. When considering aid from all sources (institutional, federal, state, local and private), 45% of all undergraduates at Barnard receive scholarships and grants. Farmingdale State College in Farmingdale, New York is part of the State University of New York (SUNY) system and ranked 28th in U.S. News & World Report's 2015 list of the best colleges in the Northern United States. Institutional grants or scholarships are provided to 45% of full-time beginning undergraduates, and the school offers three types of institutional scholarships: Alumni Scholarships, Farmingdale College Foundation Scholarships and the Institute for Learning Retirement Scholarship. The school offers more than 40 Foundation Scholarships and three Alumni Scholarships, which range between $500 and $1,000 per year. Foundation Scholarship amounts vary, but the Farmingdale Foundation Scholarship for freshmen provides $1,000 scholarships to 20 first-year students. A leading research institution, Stony Brook University offers students an enviable selection of educational options - 68 undergraduate majors and 80 minors, over 100 master's programs, 40 doctoral programs and 30 graduate certificate programs. Entering freshmen who are finalists or semi-finalists in the INTEL Science Talent Search National Competition or the National Merit Scholarships Competition are considered for a scholarship of $3,000 per year for four-years. Incoming freshmen with high academic achievements and who have overcome a disadvantage or impediment to higher education may be eligible for the Empire State Diversity Honors Scholarship. Valedictorians and salutatorians of their graduating high school class who have been admitted to the university are automatically considered for the Valedictorian and Salutatorian Scholarships. Students at the State University of New York in Albany can choose to pursue one of 120 undergraduate majors and minors and more than 125 master's, doctoral and graduate certificate programs. Entering freshmen with excellent scholastic records are automatically considered for the Presidential Scholarship. This scholarship awards up to $4,000 per year to in-state freshmen and up to $6,000 per year for out-of-state freshmen. Students in the Honors College can apply to be considered for the Irving Harold Losee Scholarship. Awards from this scholarship are meant to be used for enrichment experiences (rather than tuition, fees or room and board) such as a study abroad semester or a service-learning opportunity. Located in the beautiful Hudson Valley of Upstate New York with great views of the Shawangunk Mountains, SUNY at New Paltz offers its students a scenic campus in addition to 105 undergraduate and 50 graduate programs. Thirty percent of students receive the Pell Grant, with the average amount being $4,678. Entering freshmen with a major in Business Administration or Accounting can apply for the Dr. Donald Bishko Memorial Scholarship. Students majoring in physical sciences can apply for the Dr. Jim Campion Memorial Chemistry Scholarship. Junior or senior students majoring in education (preference given to male students) may be eligible for the Armand J. '54 and Roberta K. Trivilino Scholarship. All these scholarships award $1,000, given as a one-time grant. SUNY Genesco offers more than 50 undergraduate majors and was No. 26 in the 2018 Best College Value Rankings by Kiplinger's Personal Finance magazine. Its faculty earned honors for Best Undergraduate Teaching in northern regional colleges in U.S. News for the seventh time in 2018. When granting financial aid, Genesco first awards grant money, which doesn't have to be repaid, such as federal Pell Grants and the new Excelsior Scholarship for New York residents. Once grant money is dispensed, the college offers eligible students work-study jobs, and as a last resort, loans. The Genesco Foundation offers hundreds of scholarships, such as the Lynn Scholarship, $4,000 annually for a journalism student with demonstrated need. As the country's oldest college dedicated to studying the environment and developing renewable technologies, the SUNY College of Environmental Science and Forestry is committed to building a sustainable future for America. The merit-based Presidential Scholarship for incoming freshmen provides up to $3,000 annually for New York residents or up to $8,000 annually for non-residents. Outstanding students with financial need who do not reside in New York state, may be considered for the ESF National Scholarships, which can be worth up to $8,000 per year. Students who can prove their citizenship in one of the Haudenosaunee nations can apply for the Haudenosaunee Scholar Awards ($5,000 per year). Finalists or semi-finalists in one of the national scholarship competitions are automatically awarded the Presidential Scholarship. The SUNY College at Fredonia was established in 1826 as a regional center for teacher training, and became one of the four-year colleges in the State University of New York system in 1948. Freshmen who are Biology and Molecular Genetics majors can apply for the Yunghans-Mirabelli Science Achievement Award, while beginning students who are Bio-chemistry and Chemistry majors can vie for the Kelly/Kaminsky Chemistry Achievement Award. Both are annual scholarships worth $8,000 each. Incoming freshmen who graduated at the top 10 percent of their high school class may be eligible for the Keeper of the Dream Scholarship ($4,000/year). Non-New York state residents admitted as freshmen may be considered the merit-based President's Out Of State Scholar Award ($5,000/year). Located on a 930-acre wooded campus above the Susquehanna River, Binghamton University is a premier public university with rigorous academics and a dedicated, multi-awarded faculty. Incoming freshmen who plan to study finance, human resources, MIS, marketing or operation management may be eligible for the Allen & Ellen Zwicker Scholarship. Political Science majors with good academic background may be considered for the Paul & Joyce Smith Scholarship. Freshmen with demonstrable financial need and who have been accepted to the Decker School of Nursing may be eligible for the Lester Casper Nursing Scholarship. The Charlene & Roger Kramer Scholarship supports admitted freshmen from New York State with a record of academic excellence who can show financial need. Located in the foothills of the Allegheny Mountains, Alfred University has a progressive history as one of the first colleges in the U.S. to admit women, African Americans and Native Americans. Today's students can expect substantial help with the cost of attendance, with 98% of full-time beginning undergraduates receiving institutional grants or scholarships. Pell Grants are awarded to 38% of all students, and the school also offers an interest-free monthly payment plan and employment through the Federal Work-Study program. CUNY Queens College has alumni that range from famous musicians like Paul Simon and Carole King to popular comedians like Jerry Seinfeld and Ray Romano. Incoming freshmen with excellent academic records can apply to become Queens College Scholars and receive merit-based scholarships that cover up to half of their tuition (presently $6,030 per year). All full-time students can apply for the Queens College Foundation Internal Scholarship, which offers between $250 and $2,500 per semester to academically excellent students with financial need. CUNY Queens College is also one of the eight CUNY institutions that participates in the Macaulay Honors College program, which offers full-tuition scholarships to the school's most academically competitive applicants. Students at the SUNY College of Cortland can choose from 62 undergraduate majors, 35 graduate majors and 4 certificates of advanced study. Students who meet the requirements are automatically considered for the SUNY Cortland Merit Scholarship ($3,000/year for four-years for freshmen, $3,000/year for two years for transfer students). Freshmen majoring in childhood and early childhood education can apply for the Laura W. Jopling '33 Scholarship, while freshman economics majors can apply for the Gerald M. Surette Scholarship in Political Economy. Both scholarships are worth $2,500 each. The Cortland Urban Recruitment of Educators Scholarship supports beginning students (including transferees) who come from under-represented groups in the teaching profession and who plan to teach in high-need urban schools after graduation. Project-based learning is at the core of education at Alfred State, where students learn by working on real-world problems, resulting in a 99 percent employment and transfer rate. Students can apply for the Excellence in Education Scholarship (pays for tuition, room and board), the Presidential Scholarship (pays for room) and the All-American Scholarship (pays for board). Qualified freshmen may also be considered for the Academic Distinction Scholarship ($1,000/year). Transfer students may be eligible for the Transfer Scholarship ($1,000/year). The Phi Theta Kappa External Transfer Scholarship supports transfer students who are members in good standing and entering a baccalaureate program at Alfred State ($2,000/year). Located in the city that never sleeps, St. Joseph's College New York has much to offer its students, including baccalaureate degrees in 29 majors, a 12:1 student-faculty ratio, and one of the lowest tuitions in the tri-state area. Academically outstanding freshmen are automatically considered for the following scholarship programs: Presidential Scholarship (full tuition), Provost Scholarship ($15,000 per year), Dean's Scholarship ($13,000 per year) and the Scholastic Achievement Award ($6,000 to $9,000 per year). Transfer students with excellent academic performance may be eligible for the Academic Achievement Scholarship ($7,000 to $10,000 per year). Graduates of Catholic high schools who are not eligible for other scholastic achievement programs may be awarded the Catholic School Grant ($1,000 per year). CUNY Hunter College is located on the Upper East Side of Manhattan, and is the largest college in the City University of New York (CUNY) system. Although close to 70% of full-time beginning undergraduates receive some financial aid, only 6% receive institutional grants or scholarships. Through the Freshman Scholars Program, Hunter College provides merit-based scholarships to freshmen in several academic disciplines. The Muse Scholarship, for example, is provided to students with talent in the arts, and it covers a significant portion of the recipient's tuition for four-years. Another freshman scholarship, the Jenny Hunter Scholarship, provides academically outstanding students with $1,000 tuition awards for four-years. Additionally, incoming students admitted into CUNY's Macaulay Honors College receive full-tuition scholarships. Located in the heart of New York City, CUNY City College is the flagship location of the City University of New York system. Over 75% of full-time beginning undergraduates receive some type of financial aid, although only 5% receive institutional grants or scholarships. Scholarships to incoming freshmen and transfer students are awarded primarily based on merit rather than financial need, including the full-tuition scholarship offered to students admitted into the school's Macaulay Honors College. The college also participates in the state of New York's SEEK Program, which provides economically disadvantaged students with up to ten semesters of tuition assistance (ranging from $500 to $5,000 per semester) and grants to cover the cost of CUNY fees, books and supplies. Formed from the merger of the SUNY Institute of Technology and the SUNY College of Nanoscale Science and Engineering, the SUNY Polytechnic Institute offers undergraduate and graduate degrees in nanoscience and nanoengineering. SUNY Poly typically awards merit scholarships to the top 20 percent of admitted freshmen each year. Transfer students with excellent academic records may be eligible for the Transfer Achievement Scholarship ($1,500 or $2,000 for two years). Transfer students who have overcome adversity or who can demonstrate contribution to the diversity of the student body may be considered for the Empire Diversity Honors Scholarship ($750 to $1,500 per semester for two years). The President's Opportunity Fund for Student Success Scholarship supports returning SUNY Poly students who have unmet financial need. SUNY Plattsburg's extensive internship program gives its students real-world experience as well as the chance to develop important career connections. Freshmen with excellent academic records may be considered for the following merit-based scholarships: Presidential Scholarship ($6,470 to $10,470/year), Freshmen Academic Excellence Scholarship ($3,500 to $6,500/year), Freshmen Merit Scholarship ($3,000 to $6,000/year), and the Freshmen Recognition Scholarship ($4,000/year). There are also scholarships available for transfer students: Transfer Achievement Scholarship ($500 to $5,000/year), Transfer Merit Scholarship, ($1,000 to $5,000/year), and the Transfer Recognition Scholarship ($4,000/year). Freshmen admitted to the Educational Opportunity Program (EOP) based on an economic or academic disadvantaged status may apply for the First Year EOP Scholarship ($1750). Founded in 1816, SUNY Potsdam is the home of The Crane School of Music, the country's largest and oldest music school established primarily for the preparation and education of public school music teachers. The SUNY Potsdam Freshman Scholars Program provides support for admitted students with excellent academic history. Awards for in-state freshmen begin at $1,000 per year, while awards for out-of-state freshmen begin at $5,000 per year. The most prestigious award for incoming freshmen at SUNY Potsdam is the Mt. Emmons Scholarship, only five of which are awarded each year. The scholarship includes in-state tuition, fees, a $500 credit for books, and residence hall and board waiver. Education majors can apply for the Cheryl & Lance Evans-Cummings '83 Scholarship ($2,785/year). St. Lawrence University, a private liberal arts school in upstate New York, has more than 60 majors and allows students to devise their own major if they don't find a suitable one on offer. Roughly 98 percent of students receive some sort of financial aid. Need-based grants require the FAFSA and include both federal Pell Grants and St. Lawrence University Grants, which can be as much as $44,500. Legacy students can get a $2,500-per-year grant regardless of need. Most of the university's scholarships reward academic achievement, with the Momentum Scholarship worth $32,000 annually. Other scholarships are based on leadership or community service. The financial aid office also helps students find part-time, on-campus jobs. Two undergraduate colleges (the founding Russell Sage College for women in Troy and the coeducational Sage College in Albany), three graduate schools, and the School of Professional and Continuing Education together make up the Sage Colleges. Qualified first-year students are automatically considered for the following merit-based scholarships: Trustee Scholarship ($15,000/year), Presidential Scholarship ($10,000/year) and the Dean's Excellence Scholarship ($5,000/year). Transfer students may also be considered for merit-based scholarships. Award amounts range from $4,000 to $12,000 annually. RSC beginning students who are 25 years or older may be eligible for the Upton Scholarship ($3,000/year). The Opalka Family Scholarship supports students from the RSC elementary education and SCA art programs and who have graduated from Averill Park High School. According to U.S. News & World Report's 2015 college rankings, CUNY Brooklyn College in Brooklyn, New York is the 70th best university in the Northern United States. Brooklyn College provides institutional grants or scholarships to 6% of full-time beginning undergraduates, with more than 600 scholarships and awards available to undergraduate and graduate students each year. Through the Brooklyn College Foundation's Presidential Scholarship, students receive up to $4,000 per year for four-years. Federal Pell Grants are awarded to 52% of full-time beginning undergraduates, with awards ranging from $302 to $5,645 depending on funding. Canisius College in Buffalo, New York was founded in 1870 by the Catholic religious order of Jesuits and is one of 28 institutions included in the Association of Jesuit Colleges and Universities. Almost all of Canisius can expect financial assistance, with 98% of full-time beginning undergraduate students receiving some type of institutional aid. The average award at Canisius is approximately $30,200, and Canisius offers numerous merit-based scholarships to new and continuing students. In the last academic year, the college awarded $36 million in merit-based scholarships to freshman. The college also offers two interest-free payment plans that allow students to pay their tuition into more manageable monthly installments. As the largest and most comprehensive institution in the 64-campus State University of New York system (SUNY), the University of Buffalo offers more than 100 undergraduate degrees and almost 300 graduate and professional programs. For the academic year 2014-2015, the university awarded more than $3.5 million in scholarships to incoming freshmen. Beginning students with stellar academic credentials are encouraged to apply for the Presidential Scholarship, which covers full tuition, fees, housing and books for four-years. There is no additional application required for the Provost Scholarship and the Daniel Acker Scholarship. Students pursuing a STEM degree may be eligible for the NYS STEM Incentive Program, which provides a full SUNY tuition scholarship. Recipients must commit to work in a STEM field for five years after graduation. Located in the foothills of the Catskill Mountains, SUNY Delhi offers 13 baccalaureate programs, more than 40 associate degree programs and a Master of Science in Nursing Education. Full-time Delhi students may apply for the following scholarships funded by the College Association at Delhi, Inc. (CADI): J. William Harniman Scholarship ($2,500/year), General Student Scholarships ($1,000/year) and the CADI Employee Scholarship ($1,000/year). To be considered for the last scholarship, students must be CADI employees. In addition to the Presidential Scholarship, which covers full tuition for students from Delaware and Otsego Counties, there are 27 other College Foundation scholarships for which SUNY Delhi students can apply. Cazenovia College in Cazenovia, New York was ranked 24th on U.S. News & World Report's 2015 list of best regional universities in the Northern United States. Institutional aid is offered to 99% of full-time beginning undergraduates, and includes four different types of scholarships and one grant program. Cazenovia's Academic Achievement Awards are given to academically outstanding first year students, and the Cazenovia College Grant is awarded based on financial-need. Three governmental grant programs are available at the college: the Higher Education Opportunity Program, Project REACH and the College Science and Technology Entry Program (CSTEP). Cazenovia also offers a tuition payment program that allows students to pay their tuition over a ten-month period. Established as the Schoharie State School of Agriculture in 1911, SUNY Cobleskill joined the SUNY system in 1916 and now offers 41 associate and 15 bachelor's degree programs. There are over 180 different scholarships available at SUNY Cobleskill, including the Effie Bennett-Powe Scholarship Endowment for Early Childhood students, the Robert E. & Ethel M. Benninger Endowed Catering Scholarship for Culinary Arts students, and the George Berner Scholarship Endowment for School of Agriculture and Natural Resources students. Fifty-nine percent of SUNY Cobleskill students qualified for the Pell Grant, with the average grant award amounting to $4,111. The average first-year financial assistance package is $8,370. Students from 47 states and 67 countries call SUNY Purchase home: it was established 1967 for the purpose of combining programs in the liberal arts and sciences with conservatory training in the visual and performing arts. Qualified freshmen admitted to the School of Liberal Arts and Sciences may be considered for the Merit Scholarship ($2,000/year for in-state students, $3,000/year for out-of-state students) or the Presidential Scholar Award ($3,000/year for in-state students, $4,000/year for out-of-state students). Talent-based merit scholarships are available for freshmen admitted to the School of Arts. These scholarships are awarded based on a student's artistic ability or potential, as evidenced by an audition, portfolio review, essay and interview. Hilbert College in Hamburg, New York was founded by the Franciscan Sisters of St. Joseph in 1897, became a teacher's training college in 1957 and began offering four-year degrees in 1992. The college provides institutional grant and scholarship awards averaging $6,101 per year to 95% of full-time beginning undergraduates. Incoming freshmen with a record of academic excellence are eligible for up to eight different institutional scholarships, including the $8,000 Annual President's Scholarship and the $4,000 Annual Academic Scholarship. Transfer students are eligible for two scholarships: the $4,000 Annual Transfer & Articulation Scholarship and the $7,000 Annual Honors Scholarship. Housing scholarships are also available to first-year students and provide $2,000 awards to both in-state and out-of-state students. Niagara University in Lewiston, New York is a Catholic university that was founded as a seminary school by Vincentians Priests in 1856 and is still run by Vincentians Priests to this day. Niagara University provides institutional grants or scholarships to 98% of full-time beginning undergraduates, with students receiving an average institutional gift award of $17,459. Through the Vincentian Scholars Program, the university provides three incoming freshmen with $5,000 awards that are renewable for four-years. Transfer students are eligible for Transfer Scholarships and Transfer Awards, which range in amount from $8,000 to $14,000 per year. The school also offers the need-based Niagara University Economic Grant. Founded by a group of Franciscan Brothers in 1859 as a school for boys in the diocese of Brooklyn, St. Francis College now has close to 2,800 students representing 80 countries and has 19 academic departments offering 72 major and minor fields of study. Ninety-five percent of all students receive some form of financial assistance. Incoming freshmen with excellent academic records are considered for the following scholarships: Presidential Scholarships ($12,000 to $16,000 per year), St. Clare Scholarships ($8,000 per year), St. Francis Scholarships ($8,000 to $10,000 per year), and the Academic Achievement Awards ($3,000 to $5,000 per year). Transfer students may be eligible for the Transfer Students Scholarships ($3,000 to $5,000 per year). 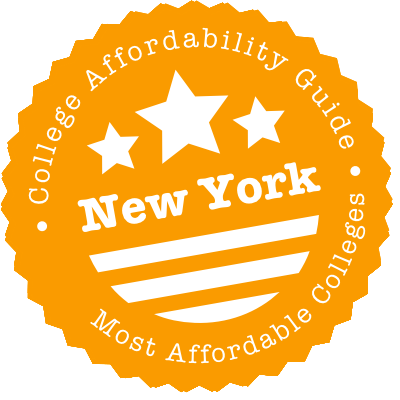 When it comes to a cheap college experience in New York, you’ve got options. Colleges in the SUNY & CUNY systems offer substantial financial aid and there are plenty of smaller private schools that subsidize low-income students. Even better, New York has a truckload of state financial aid packages, including Tuition Assistance Program (TAP) grants, memorial scholarships, teacher incentive programs and loan forgiveness deals. Most of these programs are only available to New York State residents, but check the fine print for details. New York does not offer a statewide college credit transfer system, but colleges and universities are encouraged to have transfer and articulation agreements. The City University of New York (CUNY) and The State University of New York (SUNY) both offer transfer agreements that extend to other colleges and universities in the state of New York. SUNY offers Transfer Paths for students planning their transfer to a campus within their system. These transfer paths offer a summary of the common lower division requirements for all SUNY campuses for similar majors. This is a great tool for students who are not yet enrolled in SUNY, but planning to attend. CUNY’s Pathways general education framework is designed to work within the CUNY system, but is also typically accepted by other colleges and universities. CUNY notes that Pathways courses are similar to national norms, which facilitates transfer to other educational institutions. When it comes to state financial aid, start with the Higher Education Services Corporation (HESC), a great website run by New York’s Office of Higher Education. It has specific information for all kinds of New York residents—recent high school graduates, transfer students, returning students and military & veterans. Here you can get help with your FAFSA, compare financial aid packages from colleges, quickly apply for a TAP grant and manage your student loans. You can also browse through a list of NY state scholarships and awards to a) see if you’re eligible and b) find out if you need to fill out a separate application form. To receive payment on most of these awards, you will also need to file your FAFSA and complete a TAP grant application—so get ’em both in! Call HESC’s helpline: 1-888-NYSHESC (1-888-697-4372) for answers to specific questions. Current high school students who are looking for a cheaper college degree may also want to check out HESC’s GoCollegeNY. This website is particularly targeted towards teenagers who need help preparing for college. There are videos featuring students who have survived the college application process; year-by-year checklists for freshmen, sophomores, juniors and seniors; step-by-step instructions on how to apply for financial aid; and ways to customize your college plan. If you’re considering one of New York’s 100+ private, non-profit colleges and universities, have a look at New York Colleges. Like GoCollegeNY, this has advice on how to plan for college and how to pay for college, but it also has in-depth profiles of each private college, with info on tuition & fees, application deadlines and demographics. With the right financial aid package, a private college may end up being affordable. Summary: APTS awards are tuition grants given to New York residents enrolled in eligible, part-time undergraduate programs at certain institutions in New York State. HESC distributes APTS funds to participating colleges; each school is responsible for allocating money to students. Grants are based on your family income, so award amounts vary, but you may be eligible for up to $2,000 per year. See the APTS website for more details (e.g. income limits). How to Apply: Since APTS grants are given out by institutions, you should ask the Financial Aid Office if your college/university participates in the APTS program. If it does, the office will give you an APTA application. Complete this as soon as possible! Funds are limited and schools allocate money on a first-come, first-serve basis. Summary: This grant is given to enrolled members of New York State tribes or children of an enrolled member of a New York State tribe who are attending—or planning to attend—a college in New York. Eligible students include members of the Iroquoian tribes (St. Regis Mohawk, Oneida, Onondaga, Cayuga, Seneca Nation, Tonawanda Band of Seneca, and Tuscorora), the Shinnecock tribe and the Poospatuck tribe. If you qualify for a grant, you may receive up to $2,000 per year for a two-, four- or five-year degree program in a New York school. There are no age restrictions on eligibility. Students registered for less than 12 credit hours per semester are considered part-time and are funded on a prorated basis. Funds can’t be used for remedial, noncredit-bearing or college preparation courses. How to Apply: Complete the separate New York State Indian Aid application form on the NYSED website. Summary: Also known as the Educational Opportunity Program (EOP), HEOP provides financial aid and special academic assistance (e.g. counseling, tutoring & supplemental instruction) to low-income New York residents from disadvantaged backgrounds who show potential for college. Even if you don’t meet the requirements for regular admission, you may still be able to attend the two-year or four-year college of your dreams. Examples of participating schools include SUNY, NYU and Cornell, and there are more! How to Apply: Ask your college or university if it participates in EOP/HEOP. If it does, someone at the Opportunity Program Admissions Office or Financial Aid Office will be able to help you with applications and financial aid forms. Summary: Part-time TAP grants work on the same lines as the TAP, but they’re intended for New York State residents who only want to study part-time at an eligible school in New York State (grants are not given for out-of-state schools). See the Part-time TAP website for more details. How to Apply: Complete your FAFSA and the TAP application. Summary: This program rewards New York AmeriCorps volunteers who have made a difference in their community. Award money can be used to pay for education costs at qualified institutions of higher education, for educational training or to help repay qualified student loans. Award amounts are tied to maximum value of the Pell Grant, so contact your local AmeriCorps organization to learn how much you may receive. Eligibility: Education awards are given to students who have successfully completed a term of service in AmeriCorps State and National, AmeriCorps VISTA or AmeriCorps NCCC programs. How to Apply: Contact your local AmeriCorps organization for more details on how to apply for AmeriCorps programs and receive awards. Community service projects will vary from site to site. Summary: TAP awards are tuition grants given to New York State residents who attend an eligible school in New York State (grants are not given for out-of-state schools). Award amounts are based on your family income, so grants vary, but you may be eligible for up to $5,165 per year. TAP is the largest grant program in New York, so it’s worth trying for one. See TAP Eligibility & Income Limits for more details on specifics (e.g. conditions for renewal, income numbers, etc.). How to Apply: Complete your FAFSA. At the end of the FAFSA form, you’ll find a link to the TAP application. If you missed this, don’t worry. You can go straight to the TAP application. Summary: This scholarship provides financial aid for college to children, spouses or financial dependents of individuals killed as a direct result of the crash of Continental Airlines Flight 3407 in Clarence, New York on February 12, 2009. The award covers tuition, non-tuition costs and room & board for up to four years of full-time undergraduate study (or five years in an approved five-year bachelor’s degree program) in a New York institution. How to Apply: Complete the separate Flight 3407 Memorial Scholarship Supplement. Summary: This scholarship provides financial aid for college to children, spouses or financial dependents of individuals killed as a direct result of the crash of American Airlines Flight 587 in the Belle Harbor neighborhood of Queens, New York on November 12, 2001. The award covers tuition, non-tuition costs and room & board for up to four years of full-time undergraduate study (or five years in an approved five-year bachelor’s degree program) in a New York institution. How to Apply: Complete the separate Flight 587 Memorial Scholarship Web Supplement. Summary: NY-AIMS is a merit-based scholarship given to outstanding New York high school graduates who enroll, or plan to enroll, in a public or private New York college immediately after high school. Each awardee receives an annual award of $500 for four years of undergraduate study (or five years if the program of study normally requires that time). Scholarship recipients are selected and prioritized based on their unmet need. How to Apply: Complete the separate NY-AIMS application form. Summary: This scholarship is aimed at outstanding undergraduates who want to pursue a master’s degree in education at a SUNY or CUNY college or university. In return for a promise to teach in a New York public elementary or secondary school for five years, the scholarship fund provides 500 students with full graduate tuition. Eligibility: Please see HESC’s table on New York State scholarships for more information. How to Apply: You’ll need to fill in a separate application form from HESC. Please see HESC’s table on New York State scholarships for more information. Summary: This scholarship is offered to full-time undergraduate or graduate students (in approved programs) who are pursuing a math or science teaching career in secondary education (grades 7-12). In exchange for five years of full-time employment as a teacher in New York State, you may be eligible to receive an annual award for full-time study for four years of undergraduate study and one year of graduate study. This award is equal to the cost of annual tuition charged to a New York resident attending an undergraduate program at SUNY (i.e. in-state tuition), or actual tuition charged, whichever is less. Please see the scholarship website for conditions on renewal (e.g. minimum GPA, minimum credit hours, etc.). How to Apply: You can’t apply for this program until you’ve completed one semester of college. Once you’ve completed your fall semester, visit the HESC website and complete the separate scholarship application form (available January 1 of each year). Summary: This scholarship provides financial aid for college to children, spouses and financial dependents of certain public employees who have died as the result of injuries sustained in the line of duty in service to the state of New York. Those employees include firefighters, volunteer firefighters, police officers, peace officers (including correction officers) and emergency medical service workers. The scholarship covers tuition, non-tuition costs and room & board for up to four years of full-time undergraduate study (or five years in an approved five-year bachelor’s degree program) in a New York institution. How to Apply: Complete the separate NYS Memorial Scholarship Web Supplement. Summary: The state awards a $1,500 college scholarship to the top graduating scholar (i.e. valedictorian) at each registered high school in New York State. Any remaining $1,500 scholarships and an additional 6,000 scholarships of $500 are awarded to other outstanding high school graduates. Awards are renewable for up to five years of undergraduate study at an in-state institution. The scholarship is revoked if you start attending an out-of-state institution. How to Apply: Please see your high school guidance counselor for information on applying. The State Education Department will notify students who have been nominated by their high schools to receive the scholarship. Once you’ve received notification, you’ll need to submit an application for payment to HESC by June 30 of each year for which assistance is sought. Application for payment is made by filing the FAFSA and the TAP application. Summary: This program provides a full SUNY or CUNY tuition scholarship for the top 10% of students in each New York State high school if they promise to pursue a STEM degree (associate or baccalaureate) and agree to work in an approved STEM occupation in New York for five years after graduation. Annual awards for full-time study are equal to the cost of annual tuition charged to New York residents attending an undergraduate program at SUNY (i.e. in-state tuition), or actual tuition charged, whichever is less. How to Apply: Complete the separate NYS Science, Technology, Engineering and Mathematics (STEM) Incentive Program Application. How to Apply: Complete the separate NYS World Trade Center Memorial Scholarship Web Supplement. Summary: Aimed at recent New York college graduates, this program provides up to two years of federal student loan debt relief to graduates who are participating in a federal income-driven repayment plan where payments are generally capped at 10% of their discretionary income. Eligible student loans include the federal Income Based Repayment plan at 10% of discretionary income, the Pay as You Earn plan and the Revised Pay as You Earn plan. Graduates receive a maximum of 24 payments equal to the payment amount for the monthly federal repayment plan. How to Apply: Complete the separate GOYF Program Application. Summary: This program provides loan repayments to New York residents currently working as a District Attorneys, Assistant District Attorneys or Indigent Legal Services Attorneys. The maximum award is $20,400 (or the recipient’s eligible student loan debt at the time of application, whichever is less); annual disbursements are equal to $3,400 (or the recipient’s remaining loan indebtedness). Payments are available for up to six years of qualified service. How to Apply: Complete the separate DALF Program Application. Summary: This loan forgiveness program is aimed at increasing the number of nursing faculty members and adjunct clinical faculty teaching in the field of nursing in New York State. The maximum lifetime award is $40,000, paid in the amount of $8,000 for each annual period of qualified service completed (or the applicant’s actual eligible student loan indebtedness at the time eligibility is established, whichever is less). Payments are available for up to five years of qualified service. How to Apply: Complete the separate NFLF Program Application. Summary: This loan forgiveness program is intended to increase the number of licensed social workers working in critical human service areas throughout New York State (e.g. home care, health, mental health, substance abuse, aging, HIV/AIDS and child welfare or communities with multilingual needs). The maximum award is $26,000, paid in the amount of $6,500 for each annual period of qualified service completed (or the applicant’s eligible student loan indebtedness at the time eligibility is established, whichever is less). Payments are available for up to four years of qualified service. To determine if your workplace is an eligible service area, you can look at Eligibility by County. How to Apply: Complete the separate LSWLF Program Application. Summary: As the name might suggest, this program is intended to help recent college graduates pursue careers in farming throughout New York State. The maximum lifetime award is $50,000, paid in the amount of $10,000 per year (or the applicant’s actual eligible student loan indebtedness at the time eligibility is established, whichever is less). Payments are available for up to five years. How to Apply: Complete the separate NYS Young Farmers Loan Forgiveness Incentive Program Application. Summary: This program aims to increase the number of physicians—especially primary care physicians—practicing in areas of New York State with a shortage of physicians. The state awards up to $10,000 per year for two years; award amounts are based on undergraduate and medical school student loan amounts, loan interest expense and income. Recipients must agree to practice medicine for a period of 12 months for each annual payment received and they must serve a minimum of 24 months regardless of the amount of payment received. Applicants cannot currently be a recipient of any of Federal Loan Physician Repayment Award program. How to Apply: Complete the separate Regents Physician Loan Forgiveness Award Program Application. Summary: Known as MSRS or MERIT, this scholarship provides financial aid for college to children, spouses and financial dependents of members of the U.S. Armed Forces or of a state organized militia who were New York residents and—at any time on or after Aug. 2, 1990—died or became severely and permanently disabled while engaged in hostilities or training for hostilities. (Please see the MSRS scholarship website for exact details.) The scholarship covers tuition, non-tuition costs and room & board for up to four years of full-time undergraduate study (or five years in an approved five-year bachelor’s degree program) in a New York school. How to Apply: Complete the separate Military Enhanced Recognition Incentive and Tribute (MERIT) Scholarships Web Supplement. Summary: If you’re a member of the U.S. Armed Forces who is on full-time active study and stationed in New York or you’re the spouse or a dependent of such, HESC will waive New York State residency eligibility requirements for HESC awards. In other words, you don’t have to prove that you’re a New York resident to qualify for state grants and scholarships. How to Apply: Contact HESC’s Scholarship Unit at 1-888-NYSHESC (1-888-697-4372) for more information. Summary: These awards provide financial aid for college to students whose parent/s served in the U.S. Armed Forces during specified times of war or national emergency (e.g. Afghanistan, Iraq, Persian Gulf, etc.) and—as a result of that service—died, suffered a 40% or more disability, were classified as MIAs or classified as POWs. The veteran must have been a New York resident at the time of death or currently be a New York resident if disabled. The award amount is $450 per year. Eligibility: Please see the website for applicable periods of service. How to Apply: Complete the separate Children of Veterans Award Web Supplement. Summary: RIRP is designed to recruit and retain members for the State Military Forces (Army and Air National Guard, and Naval Militia). It provides college financial aid to any active service member who has successfully completed advanced individual training or commissioning. Award amounts can be up to $4,350 per year. Please the Division of Military and Naval Affairs (DMNA) website for all the details. How to Apply: Complete all the RIRP application steps listed on the DMNA website. Summary: VTAs are given to eligible veterans in an approved program (full-time study and part-time study) at an undergraduate or graduate degree-granting institution or in an approved vocational training program within New York. For full-time study, the award is equal to the cost of annual tuition charged to a New York resident attending an undergraduate program at SUNY (i.e. in-state tuition), or actual tuition charged, whichever is less. For part-time study, awards are prorated by credit hour. How to Apply: Complete the New York State Veterans Tuition Award Supplement or contact HESC. Contact the New York State Division of Veterans’ Affairs for more info and assistance. Summary: ETV is a federally-funded, state-administered program targeted at youth who were in foster care. If you qualify, you may receive up to $5,000 a year for qualified school-related expenses at a college or university. Funding is available on a first-come, first-served basis to eligible students. How to Apply: Complete the ETV Application on the Foster Care to Success website. Once those college bills start rolling in, it can be hard to keep up with basics like heat, food and healthcare. Whether you’re taking care of family or taking care of yourself, you may be eligible for state aid. Visit the website of New York’s Office of Temporary and Disability Assistance (OTDA) for info on affordable programs such as food support (SNAP), energy assistance (HEAP), emergency cash benefits, housing & support services, tax help and immigration. OTDA has instructions on How to Apply for Services and a directory of Local Departments. Another option is to call 2-1-1 or visit the website of New York 211. This telephone number is a free service to help New York residents get access to benefits & resources from government agencies and non-profit organizations. Whatever question you may have—Where can I find cheaper child care options? Am I eligible for SNAP? What happens when I can’t pay for a hospital bill?—the specialists at 2-1-1 will assess your needs and link you to resources. Residents of New York City can call 3-1-1 or visit NYC 311 for similar services. You might also want to take a look at programs run by the Community Services Society of New York (CSS). CSS is a non-profit dedicated to helping low-income New Yorkers from every part of the state. It provides counseling and assistance with public benefit programs, affordable housing, health insurance, financial planning and youth programs. Qualifying individuals and families who are struggling to make ends meet may be eligible for a small grant to tide them through an emergency. We’ve also listed a number of county-specific social service organizations in our city sections below. When it comes to on-campus housing in New York, it pays to do a little research. Some NY colleges have almost nothing but glossy, high-priced rooms and expensive meal plans; some schools have made an extra effort to make housing affordable. Living in a dorm also means you’re not paying for commuting costs, rooms are typically furnished, utilities are included in the room rate and buildings are up-to-code (e.g. properly insulated, the plumbing works, etc.). In some rural and suburban areas, your off-campus options may be extremely limited. For example, unless you file for a live-at-home exemption, SUNY Albany mandates that all freshman students live on campus for their first two years of study. Even in schools where there isn’t a requirement, students still choose to stick together—almost all Barnard first-year students live on campus. Visit the housing section on your school’s website for up-to-date information on rates and requirements. While you’re putting together your college budget, you may find that your federal and state financial aid doesn’t cover living costs. Talk to your school’s residential life/housing coordinator or the Financial Aid Office about choices. You may be eligible for private scholarships or work-study programs that will cover room and board. For example, the LCU Fund distributes millions of dollars in housing grants to 35 educational institutions in New York. Women who receive an LCU grant can use the money to obtain safe and affordable housing in New York City. Even in New York City, a lot of students save money by living at-home or sharing a cheap apartment off-campus. That’s especially for true for folks going to CUNYs, which are generally regarded as commuter schools with little or no housing options. For a clear picture of your total expenses, use the budget calculators on sites like CalcXML.com to compare on-campus costs (meal plans, dorm fees, etc.) with off-campus bills (groceries, utilities, etc.). SUNY also has a helpful breakdown of living expenses across its campuses.Once you’ve decided to live off-campus, you’re going to be overwhelmed with choices. One place to start is the housing section of your college website. Most schools have pages or sites devoted to off-campus living, with advice, links and resources. Examples include Stony Brook’s Off Campus Housing, SUNY Cortland’s Off-Campus Housing List and SUNY New Paltz’s Off-Campus Housing Bulletin Board. FIT provides updated listings that are only accessible to current students. After you’ve explored university websites, you can expand your search for cheap apartments to Craigslist (just be vigilant about scams—people love to try and take advantage of students). A number of websites, such as CampusRent.com, ApartmentGuide.com and MyApartmentMap.com, will also allow you to target affordable housing listings around your specific school. When you run into an emergency situation, the New York Homeless Shelter Directory includes emergency shelters and transitional housing opportunities. Utilities aren’t always included in rent, so read your rental agreement carefully. You need to know exactly what utilities you’re responsible for paying for and what your landlord is willing to cover. You can also ask for a monthly estimate of utility bills or talk to former renters so you’ll be able to budget. Living at home with your family or already renting? Having trouble paying for utility bills? Check with your state government. For example, New York City’s Human Resources Administration (HRA) runs the “One Shot Deal,” an emergency assistance program helps people who cannot meet an expense (e.g. rent, utilities, etc.) due to an unexpected situation or event. OTDA administers HEAP, a federally funded program that helps low-income New Yorkers afford to heat their homes. Power companies such as Con Edison and National Grid also offer low-income programs to eligible customers—when in doubt, call the company and ask what’s available. There’s also an excellent list of NY utility assistance programs on HITE.org. Almost every major university will have its own health center to provide free or affordable medical care to students. The bigger and better funded the university, the flossier the center. For example, the Student Health Services center at SUNY Albany is staffed by M.D.s, D.O.s, PA-Cs and ARNPs and offers a range of services, from general medical care and lab tests to prescriptions and psychiatric care. In comparison, at CUNY City College the Student Health Services center is staffed by a registered nurse and offers basics like immunizations, pregnancy tests and first aid.When colleges and universities can’t help, search FreeClinicDirectory.org and NeedyMeds.org to find community clinics and health centers in New York that offer free or affordable medical care. The same steps apply to mental health crises. Talk to your student health center first to see if they’re ready to assist, then search for mental health service providers on www.800lifenet.org. If you live in New York City, you can call 1-800-Lifenet [543-3638] at any time for free and confidential advice. The Mental Health Crisis/Suicide hotline is 1-800-273-8255. Cheap dental care can be trickier to find. Some university health centers have dental services (e.g. the USG Dental Clinic at SUNY Buffalo), but a lot do not. One strategy is to see if you live near a university dental school such as the Stony Brook School of Dental Medicine, the NYU College of Dentistry and the Columbia University College of Dental Medicine. Because they’re training dentistry students, dental schools are often eager to have patients and offer lower prices than private practice. FreeDentalCare.us: New York also has a list of free and low-cost clinics in your community. The cost of child care can be a deal-breaker for college students. If you’re lucky, you may be able to find a place in your university or community college child care center. SUNY’s licensed child care centers provide care for 5,000+ children at 53 centers across the state.While you’re exploring college daycare centers, ask about subsidies and help for low-income families. For example, both CUNY and SUNY use the Child Care & Development Block Grant to provide tuition subsidies for 1,500+ children of income-eligible students. In a similar fashion, NYU offers a childcare subsidy to eligible graduate students. Nothing on campus? Your county Child Care Resource and Referral Agency (CCRR) may be able to help you find a cheap(ish) alternative. They’ll ask a few questions about your situation and refer you to a list of local child care providers. Another alternative is to search for affordable New York child care options on the website for the Day Care Council of New York. On the state level, OTDA has a useful page on state child care subsidies; New York City residents looking for subsidized child care will deal with the Administration for Children’s Services (ACS). We’ll state the obvious and say that anyone attending a New York City school is going to have access to extensive public transportation options. But outside of New York City you may end up needing a car in the winter. It’s worthwhile visiting the transit/transportation section of your university’s website, no matter where you decide to live. That’s because schools post a huge amount of info on transport discounts for students, ride sharing, free campus shuttles, biking options (e.g. rentals, shares, used bike sales) and more. Schools with a lot of low-income students often go the extra mile. For example, CUNY provides free MetroCards to any student in its Accelerated Study in Associate Programs (ASAP). Student discounts are also available from local transport companies. Both Trailways and ShortLine offer a 15% discount to students who present a valid student ID. Full-time college students save 25% on NJ TRANSIT Monthly Passes if their school participates in the partnership program (that list includes CUNY City College, FIT and NYU). Food is usually the first thing to be cut from a college budget. Please don’t go hungry while you’re studying—CUNY has a large number of free food pantries spread across its community college and regular college campuses. SUNY has 15+ options, including pantries on the Stony Brook campus on Long Island and the New Paltz campus in Ulster County.If colleges can’t help, community organizations can. FoodPantries.org has a long list of New York Food Pantries and HomelessShelterDirectory.org has a similar database of NY soup kitchens, pantries and food banks. If you need emergency food immediately, call the Upstate Hunger Hotline at 1-866-526-2978, the Food Bank for NYC at 212-566-7855 or the NYC Hunger Hotline at 1-866-888-8777. New moms or moms-to-be might also want to see if they qualify for the New York WIC Program. The real challenge in New York City is—no surprise—finding a cheap place for you and your roommates to live. Sperling’s Best Places puts the average cost of housing in NYC at three times the national average. Groceries, utilities and miscellaneous expenses (e.g. clothing, repairs, entertainment) are also above the norm. Since public transportation is everywhere, some students choose to live further out of the city (e.g. New Jersey), where prices have stabilized, and commute into town. General info for residents can be found on the City of New York website. Attending college on the cheap in a city like New York can feel impossible. You may be wrestling with family problems, worrying about loan debt, trying to afford food or rent and struggling with child care. Here are some NYC non-profit organizations that exist to help. NYC Housing Connect links NYC residents to affordable housing. Here you can view current and upcoming housing opportunities and fill out an application for your household. We also recommend the How to Find Housing page on the Housing Preservation & Development (HPD) website. This has a lot of useful links to affordable rental programs. Single Stop USA has a huge number of offices in New York City. Single Stop counselors can connect you to all kinds of low-income benefits, including food stamps, health insurance, child care subsidies, energy assistance, affordable housing and tax credits. Counselors will answer any questions you have and help with application forms. Women’s Housing and Economic Development Corporation (WHEDco) serves residents of the Bronx. It offers a variety of programs, including family support services (e.g. food pantry, benefits counseling, mental health counseling), a home-based childcare network, green housing and a teen program to prepare students for college. The New York Urban League (NYUL) focuses on education and employment, with services like college access programs, college scholarships, career-readiness workshops, talent matching and training programs referrals. NYUL also has a Technology Learning Center in its Harlem office. In a city with 8 million people, there are always people willing to lend a hand. It’s common knowledge that the average cost of housing in Buffalo is low. Groceries, utilities and transport costs are around the national average, and the city is fairly bikeable in warm months (but it’s under snow in others). A lot of folks choose to drive. On the downside, certain neighborhoods in Buffalo have experienced a rise in rents as the city economy has improved, so you may have to go hunting to find a good deal. General info for residents can be found on the City of Buffalo website. Buffalo can be a tough place to exist, especially when you’re juggling heating bills, rent, family needs and commutes. If you’re living at home, going to school as a first-generation student, worrying about your college readiness or looking for affordable housing, these organizations will step up to help you. The Erie County Department of Social Services administers Buffalo’s temporary assistance & emergency assistance grants, the SNAP program (food stamps), Medicaid and HEAP (energy assistance program). The Jewish Family Service of Buffalo & Erie County offers health and social services to all Buffalo residents regardless of religious affiliation, ethnicity, race, culture, gender or ability to pay. Those services including immigrant assistance, mental health counseling, parenting support and vocational training. People United for Sustainable Housing (PUSH Buffalo) is a community organization that supports affordable housing on Buffalo’s West Side. It runs an assortment of housing projects, energy efficiency programs and a community center. It also advocates to bring new resources and government money to the West Side. Say Yes Buffalo is an education-based organization that runs all kind of college preparation programs (e.g. mentoring, internships, college summer programs, mental health clinics) to support Buffalo students. It also funds scholarships to eligible graduates of Buffalo public and charter schools to all SUNY and CUNY schools and more than 90 private colleges and universities. Like Buffalo, Rochester is a Great Lakes city with a working class reputation. Off-campus living in Rochester is usually very affordable—Sperling’s Best Places puts the average cost of housing at a third of the national average. You’re going to have to get used to long winters with a lot of snow, which can be tough on vehicles; many University of Rochester students spend most of their time on campus. General info for residents can be found on the City of Rochester website. Housing may be cheap in Rochester, but that’s small comfort when you’re stuck with big bills for heat, child care, gas and food. Whatever your circumstance—whether you’re a student coming from out-of-state or a long-time resident going to college part-time—these organizations can help make life a little more affordable. Action for a Better Community (ABC) provides opportunities for low-income individuals and families to become self-sufficient. Initiatives include a summer youth employment program, job placement assistance, health services (e.g. alcohol and substance assistance) and much more. The Salvation Army of Greater Rochester, New York provides housing & homeless services, food assistance, emergency relief, help with the holidays and free/affordable summer camps. Catholic Family Center (CFC) Rochester helps with family strengthening, refugee resettlement, emergency assistance (including housing and shelters), adoption and foster care, substance abuse treatment and behavioral health. You don’t have to be Catholic to receive help. Southwest Area Neighborhood Association (SWAN) runs after-school programs, provides emergency assistance to families and manages a low-income housing cooperative. RocWiki has a list of Rochester non-profits.